The FIRST (For Inspiration and Recognition of Science and Technology) Robotics Competition was held at our Transportation Education Center (TEC) last Saturday. Twenty teams of middle-school and high-school students from six states (Michigan, Wisconsin, Illinois, Indiana, Missouri, Tennessee) competed in the event. The competition started at 10:00am with a welcome speech by Dr. Susan M. Ford, Acting Provost and Vice Chancellor for Academic Affairs. Mike Behrmann, Chair of Automotive Technology, was coordinating this competition event. Many CASA faculty, staff, and students assisted in hosting and supporting this great event first time at SIU, including Sam Chung, Craig Anz, Andrey Soares, David Miller, Mike Burgener, Karen Rotter, Zoe Owens, Student RSOs MiC and ATMEA, and several additional students from various CASA academic programs. Thanks to all these people who helped with hosting and organizing this competition event at TEC, engaging young generation in STEM and learning important skills such as problem solving, teamwork, programming, designing, as well as critical thinking. FIRST was founded in 1989 to inspire young people’s interest and participation in science and technology. The FIRST Tech Challenge (FTC) program is for students in grades 7-12 and is designed to inspire students to explore and pursue science, technology, engineering, and math (STEM) fields. This qualifying round allowed teams to compete for going to the Super Regional competition and possibly the World Championships. FIRST Tech Challenge is designed for those who want to compete head to head, using a sports model. Teams are responsible for designing, building, and programming their robots to compete in an alliance format against other teams. Each competition match had three separate periods where points can be scored. The Autonomous Period is where the robot operated via pre-programmed instructions only. During the Driver Controlled period, the robots were tasked to collecting balls and placing them into rolling goals. 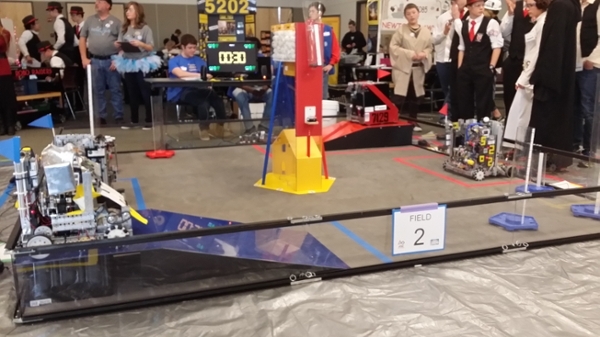 During the End Game period, the robots scored more points by placing balls in a center goal and by moving the robot and moving goals to designated areas.